‘Legends of Now’ is a curated musical series, an avant-garde music series meant to appease all your senses. Under the banner of Indent, this is an opportunity to connect with the evolved audience of the city, enjoy and appreciate art in various forms and immerse yourself in the soulful music of exceptionally talented artists from all across the world. A Trio that combines elements of Indian Classical, Jazz and World Percussions, making it a big hit for evolved audience. 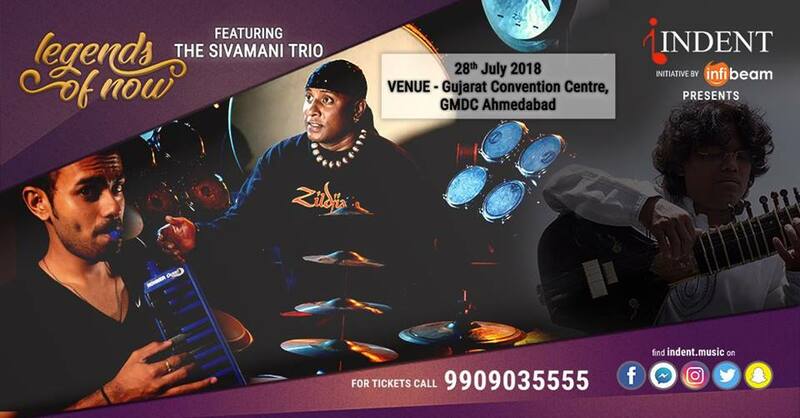 Sivamani is truly a World Percussionist, surrounding his kit with an array of instruments from around the world. He is most popular for his ability to create music out of just about anything, his performance is an audio-visual delight, hence he’s called the magician on percussions. His style is Deceptive to the uninitiated. Deeply profound and mysterious at one moment, tantalizing and exuberant at the next augmenting the brute power, are his rhythmic style and harmony, which surround the discerning listener with warmth, joy and bliss. Pt. Ravi Chary is a child-prodigy, who started playing Sitar at age 5. Highly acclaimed by critics and connoisseurs for his excellent command over Laya and Layakari, he has performed with the finest including the Late maestros Kishori Amonkar and Sultan Khan. Sangeet Haldipur is an extraordinary keyboardist, singer and film music composer, whose earliest claim to fame was as a vocalist in the Pop band Aasma.